For the Holidays card, today I used an image from Wee Stamps. It is so cute! The card is made in kraft cardstock. 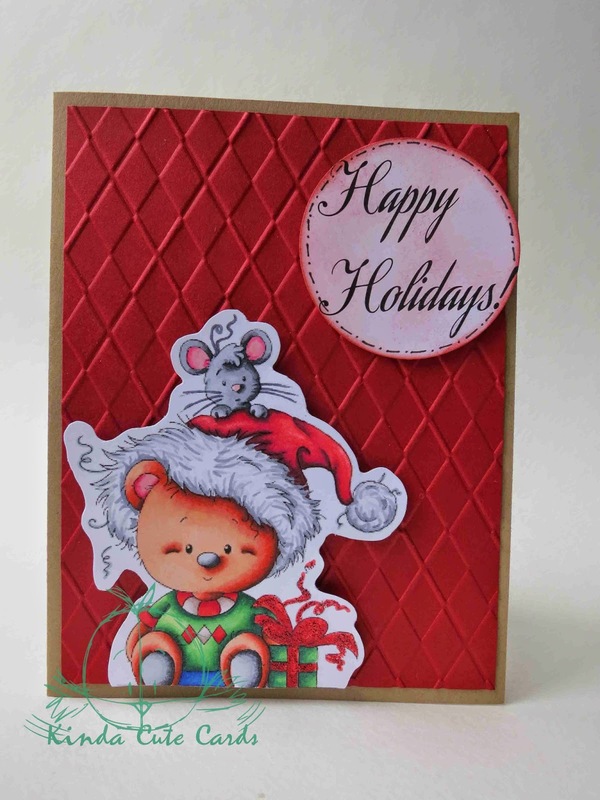 I used a panel of red cardstock embossed in Argyle background (from Darice). Mouse: CR5, CR2, PP5, IG2, IG4, IG6, IG10. Hat: DR7, DR5, DR1, CR8, IG1, IG2, IG4, IG5. Bear: PP5, CR2, DR2, TN8, TN4, OR3, CR1, FS5, IG2, IG4, IG6, IG10. Sweater: JG6, JG2, LG5, LG4, LG2, CR7, DR3, DR5, BG5, BG2, BG1. Present: JG6, JG2, LG5, LG4, CR7, DR6.